PBH-101 is a programmable IoT device server, which can be connected to the Internet via wired or wireless LAN. It supports various networking and security protocols, and encryption algorithm. It is equipped with one serial interface (RS232/RS422/RS485 supported) to connect and communicate with sensors or devices. This allows to collect data from serial equipments/sensors and send it to a various system through Internet, and vice versa. PBH-101 is embedded with a PHPoC interpreter. It allows you to pre-process data before exchanging as you want, just by writing a simple PHPoC script. It is very flexible to create customized devices to meet the diverse needs. 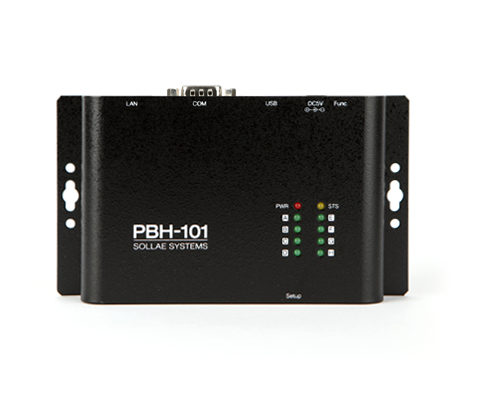 Moreover, PBH-101 comes along with an embedded web server, letting you configure settings or perform other tasks via web browser.